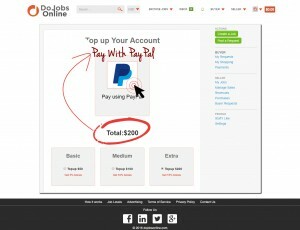 DoJobsOnline introduced a new feature for buyers that can increase your buying power. 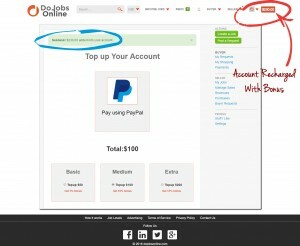 With Top-Up feature you can get up to 15% bonus cash balance in your DoJobsOnline account. If you want to get more jobs completed but have very limited cash than Top-Up feature is right choice for you. You can buy more than you paid. Top-Up simply means that if you deposit a certain amount with DoJobsOnline you can get extra balance amount in your DoJobsOnline account. Currently we are offering only three packages for Top-up feature named as Basic, Medium and Extra. How to Top-up with DoJobsOnline? 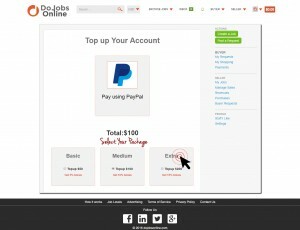 Login to your DoJobsOnline account, you will see your current balance on the top right side of your dashboard. Go to Buyer section, you will see Top-Up option in the end of list. Click on “Top Up Account” and you will be directed to Top-Up package page. Select any suitable package of $50, $100 and $150 only. Now you have to amount of your selected with PayPal. After paying for your selected top-Up package, you will get extra bonus balance immediately. You can see your total balance on the top right side of your dashboard. Enjoy this amazing feature of DoJobsOnline.